44RPM - Signature Yo-Yo of 3X World Champion Hank Freeman! 44RPM is moving beyond the laser cut wooden toys and stepping into the metal game with their latest yo-yo! This is the signature yo-yo of 44RPM co-founder and 3 time World Champion Hank Freeman! The Rhythm! Drew and Hank wanted to make the Rhythm the ideal shape to provide the ultimate in all-around everyday play at an affordable price point. They reached out to their friend and World Champion Rafael Matsunaga for help with the design and the end result couldn't have come out any better! With design input from a 3A World Champion, a 5A World Champion, and a Trick Innovator of the Year, the Rhythm really does have the feeling of a yo-yo that can do it all. It has a nice simple no-frills shape that focuses on performance without being too overly dominant in any one area. 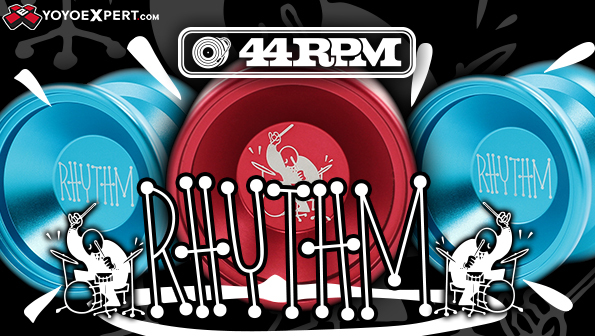 The Rhythm feels right at home blazing through tech combos or laid back slacks, perfect for any style!